The Indianapolis Colts’ cheerleader who had her head shaved in front of 60,000 cheering fans and a national TV audience had a very personal reason for agreeing to lose her locks to the team’s mascot for cancer research. Megan, whose last name was withheld by the Colts as standard team policy, was the sole Colts’ cheerleader to accept a challenge sent out by Blue, the team’s mascot, via Twitter earlier this month to support head coach Chuck Pagano in his battle against leukemia. Megan agreed to lose her locks if Blue could raise $10,000 for cancer research by Nov. 25. 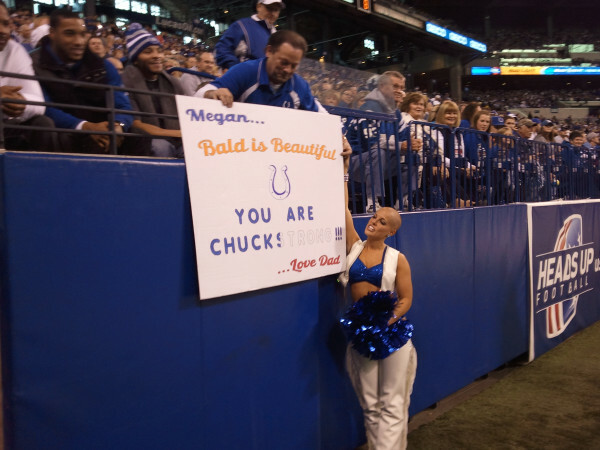 In just weeks, through fans’ donations to the CHUCKSTRONG fund on the team’s website, more than $22,000 was raised so Megan lost her hair at the start of the Colts’ fourth quarter against the Buffalo Bills on Sunday. While Megan was the only cheerleader to publicly agree to the challenge, she was joined by fellow cheerleader Crystal Ann in shaving solidarity on game day, and the two held hands as they both went under the razor. Blue’s challenge to the team’s cheerleaders came after a group of Colts’ players and coaches shaved their heads in support of Pagano, who is undergoing chemotherapy to battle his leukemia. In addition to Blue’s challenge, the team also partnered with Great Clips earlier this month to offer fans who wanted to shave their heads in honor of Coach Pagano a free buzz cut and a $10 donation to Blue’s CHUCKSTRONG Challenge. All money raised will go to the IU Health Simon Cancer Center, according to the Colts’ website. Pagano has been absent from the team’s sidelines recently while he undergoes treatment but was in the stands at Sunday’s game as his team beat Buffalo, 20-13. He received a standing ovation from fans at the game and, according to Megan, has been grateful for the fans’ and the team’s support from the start.